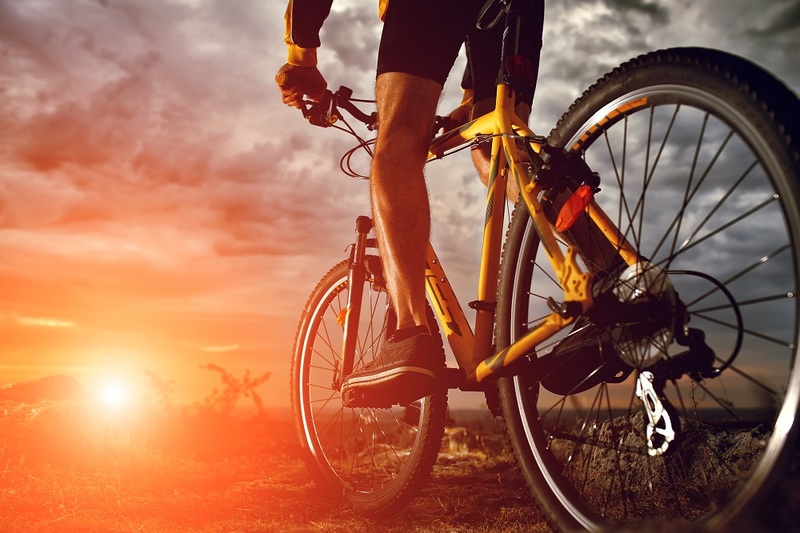 If you enjoy biking and traveling distances to discover new places on your bike with your family in 2019, then the new top-rated hitch bike racks might be your best choice. No matter which type your bike is or if you have children’s bikes or women’s bikes, these state of the art hitch bike racks are the best on the market today. Loading and unloading are extremely easy, installation is a matter of minutes, versatility and durability are their main features. Since there are many options to explore, the research process can be hard. 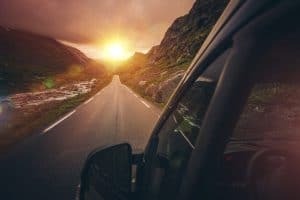 To save you some time to get a high-quality carrier, we compiled a list of the best hitch bike racks and the best platform bike racks in 2019 and also gave you some tips. 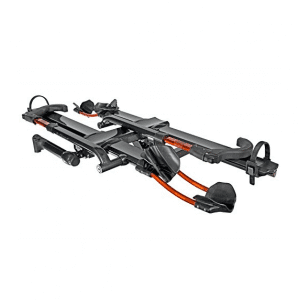 Thule T2 Pro XT has a series of features that make it really awesome. It is heavier and costs more than most hitch racks, and it requires a little more care. T2 Pro XT comes with a simple Auto Attach system and doesn’t require any tools to be attached to your car or SUV. 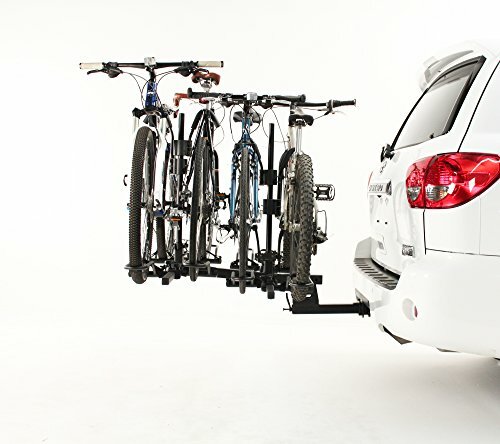 It is considered one of the best 2-bike hitch racks and it can be extended to 4-bikes with XT add-on from Thule. It is an upgraded version of the durable, easy to use and stylish Thule T2, and it has, even more, build quality and innovative features, like the remote tilt handle and tool-free vehicle attachment system. T2 Pro XT allows mounting of virtually any kind of bikes, with its 20-29” supported wheelbase and 5” thickness of the tire, without any adapters. Versatility is further enhanced at this rack by the fitting of 1.25 and 2” receivers and the possibility to extend it’s capacity to 4 bikes. Adaptability is empowered by the easy tilting process because it is slightly heavy and may be inconvenient to store in the garage assembled. Check out here more information about Thule T2 XT. Pros: versatile, durable, easy to use, excellent bike security. Conclusion: T2 Pro XT is extremely well built and it can be considered the benchmark for hitch mounted bike carriers or by many the best SUV bike rack. Kuat NV 2.0 is easy to lower due to the new and improved pivot system with foot assist so there is no risk to damage your bike. The bike cable locks on the new NV 2.0 are now improved, making them stronger and longer. It takes durability, stability, and security to the next level, being the successor of Kuat NV. It comes with an integrated work stand being one of the most feature-rich racks. 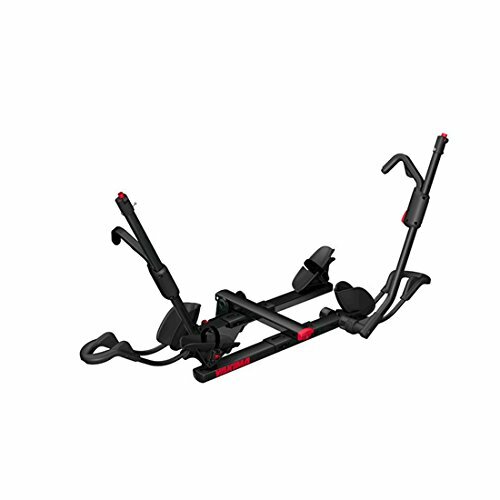 Although it doesn’t have the ergonomics of Thule T2 Pro, beautifully combines the design with great functionality. The Kuat NV 2.0 is considered to be one of the best platform bike rack. It tilts easily to give access to the hatch and we can say that it’s easy enough to remove and store, requiring a locking hitch pin. It has the ability to carry bikes with wheel sizes from 20”-29” and tires up to 4.8” making extremely versatile. The assembly process is not that easy but Kuat gives clear instructions and it is best approached by two people. The Kuat NV 2.0 uses 2 burly cable locks, really substantial in diameter compared to other carriers.The powder-coated finish is better than painted finish found on other such racks and moving parts are holding up well. Check out here more information about Kuat NV 2.0. Pros: versatile, easy to install, secure. Conclusion: Kuat NV 2.0 bike carrier is well suited to carry downhill, road and mountain bikes and basically almost any type of bike. From an aesthetic standpoint, it is the best. You can easily extend to carry 2 extra bikes with Kuat NV add-on. Excellent clearance capability since the tray can slide side to side so your bike won’t damage during transport. The 18” between the bikes make it a safe option for transporting your bikes and the SKS cable lock system further secures both wheels and frame of each bike (although it is rather difficult to use). The everyday use of this 34 lbs. aluminum hitch mount bike rack is the best on the market, as it can be assembled, installed and removed tool free and fast, being secured with the SpeedKnob instead of a classic hitch pin. Although it contains aluminum and plastic parts, the bicycle hitch carrier supports up to 40 lbs. / bike, while being no larger than 6.5″ x 58″ x 40.5″. Check out here more information about Yakima Dr. Tray. Pros: versatile, lightweight, easy to use, great clearance. Cons: not the most secure, lack of durability. Conclusion: Yakima’s Dr. Tray will suit most of the users that seek a hitch mount tray rack, due to the amazing adjustability, versatility and ease of use, and providing a great clearance. 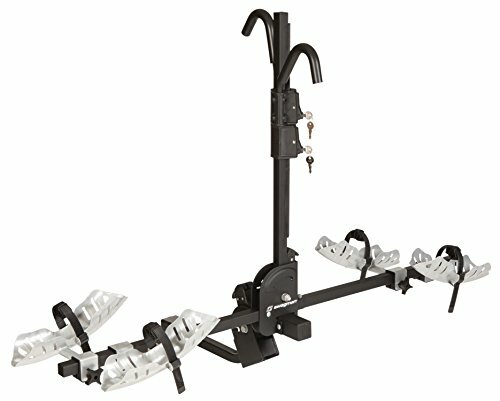 Rocky Mounts Backstage is one of the best hitch bike rack which can also swing away so you get extra 3 inches at each side of the tray for extra versatility. 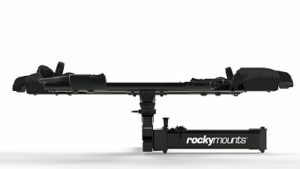 The Rocky Mounts bicycle hitch carrier carries 2 bikes, with no extension possibilities, but that does not mean it isn’t versatile. You can mount 20” to 29” wheel bikes and this platform, tray-style hitch rack will even get well with your fat bike, as it supports up to 5” wide tires. Being similar in functionality with the Thule T2 Pro XT, it’s an easy to use hitch bike rack, but the Backstage is also a little harder to remove, due to its 60 lbs. The swinging away mechanism also hardens a little bit the mounting. It does not require a larger storage space than its competitors, but the tool-assisted assembly required when it comes out of the box makes the installation a little bit harder. Although, these minor drawbacks are compensated with the durability of the bike rack, is almost entirely built of metal and its stylish black finish protecting it from scratches. The bike clearance is of 13” between the adjustable trays, make this platform hitch rack more fat bike friendly and adaptable. Last, but not least, security is one of the best assets of the Backstage, as it comes with a locking hitch pin and nose-style cable, that (even though not tool-free like the T2 Pro XT and Dr. Tray) secures the rack to the car. Moreover, the cable system is similar to the lock on the Kuat Sherpa and has the advantage of being able to be strung through wheels and the frame. Pros: versatile, swinging design, durable. Cons: heavy, no capacity for extension, could be easier to adjust. 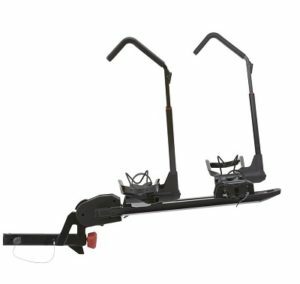 Conclusion: Backstage hitch mount bike rack from Rocky Mounts is ideal and one of the best platform bike rack if you’re looking for the best fit on your van, combined with sturdiness and versatility. Saris Freedom is unique in its versatility and design being one of the best platform bike racks for almost any type of bike including slim road ones, full suspension mountain bikes while fitting both 1 ¼” and 2” hitch receivers. Also, the trays and ratchet arm (that gives it a unique design, combining the features of the Kuat NV and Thule Parkway 4 bike) are adjustable, so that you can rest assured that any 2 bikes up to 60 lbs. each and of a maximum wheelbase of 48” will fit. Moreover, the wheelbase length can be enhanced with this bicycle hitch carrier, with an add-on from Saris. There are a few drawbacks when it comes to security (it has no security features) and durability (the plastic made trays can break if too much pressure is applied). Furthermore, although the 2 bike platform hitch rack has a protective rubber and the producer state that its compatible with carbon frames, there still is the frame contact, that you need to pay attention to. Pros: made in US, lightweight, versatile, easy to assembly. Cons: no security features, weight makes installation difficult. Conclusion: The good looking and versatile hitch mount rack worth the money and is best suitable for carrying lightweight bikes, but then again it remains one of the first choices if you’re looking for an affordable, versatile and easy to use hitch mount bike rack. Check out here more information about Saris Freedom. Swagman Chinook is relatively lightweight and the installation is pretty simple. It weighs 35 lbs. and can carry 2 bikes (up to 45 lbs. each) and fits both 1 ¼” and 2” hitch receivers. Fits most bike frame sizes, shapes, and styles. The adjustable locking hooks and the 2 same key lock cylinders easily secure the frame to the rack. Check out here more information about Swagman Chinook. Pros: lightweight, easy to install, adjustable, tilts out of the way. Cons: no capacity for extension. Conclusion: Swagman Chinook is one of the best hitch bike racks through the fact that is lightweight and easy to install, adjustable and secure. 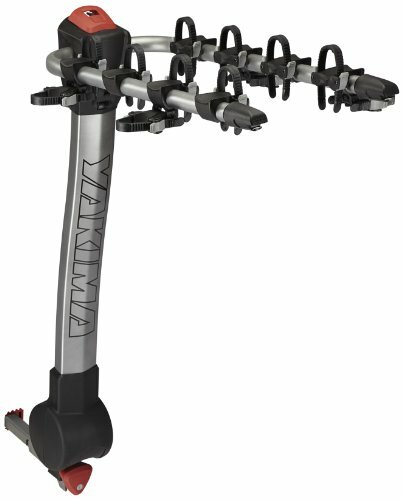 Yakima RidgeBack 4-Bike is one of the best 4-bike hitch racks as it ships ready to install and completely assembled. It features UpperHand lever that tilts down for vehicle access, Zero-hassle ZipStrips that secure your bicycle to the rack and comes fully assembled. The carrier fits both 1.25 and 2-inch receiver hitches. It is able to accommodate most bicycles and frame styles and features a really nice ratcheting strap system to secure everything in place. The slight curve to its mast keeps the pedals and other parts of the bike away from the frame. Yakima Ridgeback can easily fold away from the car. Check out here more information about Yakima Ridgeback. Pros: durable, fully assembled, fold down. Cons: heavy, a bit expensive. 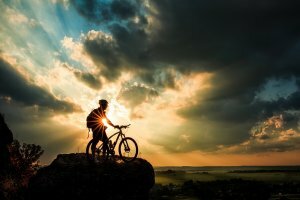 Conclusion: Even if the cost is a bit high if you are serious about riding, it worth the investment. The carrier is sturdy, safe and durable. Hollywood Racks HR1400 Sport Rider is more expensive than the other bike racks we reviewed, but you will get what you pay for. Can carry 2 or 4 bikes, is easier to use and has better build quality than most of the bike racks.It comes pre-assembled and is ready to use right out of the box. The bicycles are very secure even when going 70 mph on the highway, and the carrier is very durable.A good fit for bikes of different sizes whether they are men’s, women’s, or children’s bikes. Bicycles can be loaded extremely quickly and are held securely thanks to the ratcheting clamp design. It also folds flat when it’s not being used. Check out here more information about Hollywood Racks Sport Rider. 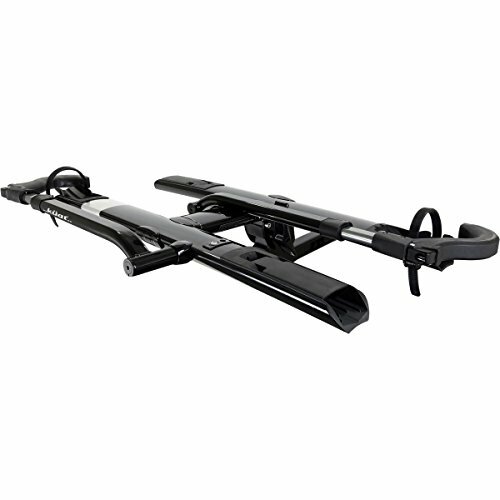 Conclusion: Hollywood Racks Sport Rider is a very durable and flexible 4-bike hitch bike carrier and fits most bike types. 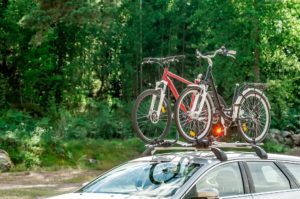 The Yakima Holdup is a relatively affordable hitch mount bike rack which tilts up and down by pulling a spring-loaded pin located back near the hinge of the carrier. It stands out with a compact design, due to the trays being hinged on the clamp end. When not in use, the wheel trays can be folded in towards the center of the rack, making it more compact for storage. The versatility goes even further because of its StrongArm design makes the loading of your bike easy, whether we’re talking about a 20’’ wheel or a 29’’ one. 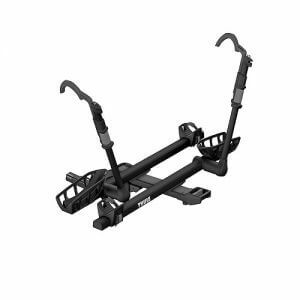 You can rely on this hitch mounted bicycle carrier even when you’re not adventuring alone in the unknown, as it carries 2 bikes in the standard version or up to 4 bikes with the optional (bought separately) Hold Up + 2. 1-1/4’’ or 2’’ hitch receiver. Check out here more information about Yakima HoldUp. Conclusion: Yakima HoldUp offers excellent ergonomics, a low loading height and a nice capacity to accommodate heavy bikes. If you are a rider committed to standard tire sizes and like to remove the hitch mount bike rack off your vehicle after every ride, the Sherpa 2.0 is a powerful contender and should be on your shortlist, because it is the lightest rack in its class (32 lbs. ), it is easy to use and offers a secure transportation to your bike. With a simple and stylish design, the Sherpa hitch bike rack is easy to use and store, especially due to its redesigned pivot with foot assist, the low loading height and the ergonomics of the front wheel clamps and rear wheel straps. The loading and unloading of the bikes is this way a piece of cake. The adjustability and adaptability on the Sherpa could be better, as it has fixed wheel trays and fits only tires up to 3” wide, with no extensions possible. This fact is somehow compensated by the platform hitch rack, as it fits 2 bikes up to 47” wheelbase, at 40 lbs. each and it can be mounted both on 1 ¼” and 2” hitch receivers. Check out here more information about Kuat Sherpa. Pros: unique design, lightweight, foot pedal tilt mechanism. Conclusion: Kuat Sherpa is an amazing platform bike rack with a unique and simple design and lightweight. Discover the full range of hitch racks – platform or hanging styles. 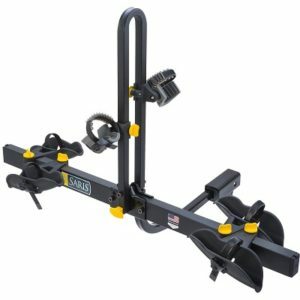 This entry was posted in Best Bike Carriers in 2018 and tagged best bike racks, best hitch bike racks.